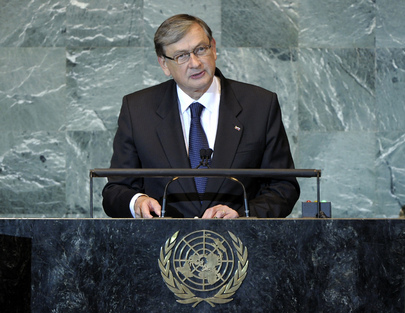 DANILO TÜRK, President of Slovenia, also welcomed the mediation theme as timely, given current focus on finding a peaceful resolution to the Israeli-Palestinian conflict. Mediation under way through the European Union aimed to revive the peace process and find an early solution, while determining an adequate status for Palestine within the ranks of the United Nations, he said. The world body was committed to its inclusive character and the universality of its membership, he said, welcoming South Sudan as the newest Member State. The Organization should render all assistance to that country’s efforts to establish its structures and serve the well-being of its people. He also welcomed the granting of Libya’s seat to that country’s National Transitional Council, which had established the much-needed link between the United Nations and the Libyan people in their efforts to build legitimate, democratic and effective institutions while pursuing the path of economic, social and political development. Noting that political and security concerns were always an important priority for the United Nations, he said they must, however, be considered against other priorities, both long and short term. The international community must take steps towards establishing a new and effective system to mitigate the effects of climate change and ensure the necessary adaptation, he said, expressing hope that the Durban Conference of Parties in December would bring the international community a step closer to final agreement. The negative impacts of climate change were disproportionate, and particular attention should be paid to the unique challenges faced by small island developing States, he said. “Rio+20” next June would be an opportunity to secure renewed political commitments to sustainable development, assess progress on implementing commitments, and address new and emerging challenges. The international community should develop a new concept to capture economic growth, social development and environmental protection, he said, adding: “It is our duty to make a difference.” Particular attention should be paid to Africa regarding attainment of the Millennium Development Goals. With the global economic crisis raging unabated in donor countries, increases in aid had proven difficult to attain, he said, emphasizing the importance of improving aid effectiveness, since there could be no gains in development if trade, agriculture, migration, climate change, and other policies cancelled them out. Furthermore, the concept of the right to development was gaining in substance and recognition, he said. Research by the Food and Agriculture Organization (FAO) showed that empowering women in agriculture could reduce hunger by 30 per cent, he noted, stressing that gender equality and women’s empowerment were essential to promoting peace, security and development. Slovenia strongly supported the work of UN Women in expanding opportunities and tackling discrimination around the globe. Slovenia also placed high value on the rights of the child and on human rights education. As the 2011 President of the United Nations Children’s Fund (UNICEF) Executive Board, Slovenia was working tirelessly to ensure universal ratification of both Optional Protocols to the Convention on the Rights of the Child, he said.